So I really am looking to sell the 240z this time around. Though, the more time I spend on it, the less I want to sell it, so perhaps I’ll continue working on it while I wait to see if it sells, and then who knows what will happen after that. At this point in time I’m not looking to part the car out, that might change in the future, but for now I’ll keep from parting it out. Thoughts: Depending on the needs, I can get the title cleared up on this car. I have a California title from a previous owner, I’ve signed it, but never got it titled in my name. It is going to cost me a couple hundred dollars to get the title in my name due to fees, if the purchaser needs a title we can have this done. Oil cooler not currently installed, bypassed, parts all there. Thoughts: The motor runs, though it is a tad picky to start. I’m pretty sure it’s a combination of the manifolds and megasquirt needing some adjustment, knowledge I just don’t have. 5 Speed from 1977 Datsun 280z 2+2, new urethane bushings on transmission mount. Thoughts: Transmission works great as far as I know, worked in the parts car that I got it out of, and also drove fine with the previous motor in this car. Thoughts: No known issues with the fuel system, everything works as it should. Thoughts: As far as I know everything works great with the Megasquirt, the only issues are that I don’t know enough to properly tune everything. Thoughts: The suspension is something I intended to address after having the car together, painted, and running. Paint: Interior painted in a black undercoating, except for the dash area which was removed after paint. Thoughts: The interior needs some love depending on your intentions. I had planned to put a cage in, but haven’t had it done. I had some Corbeau A4 seats in the car, on custom welded in mounts, but the seats were too tall. Putting in other seats may require some fabrication work. My intention was to put in a race seat. Air Dam, not sure of make, needs paint scraped off and painted. Thoughts: Passenger floor pan had some rust, cut out and welded in new metal. Floor then covered in fiberglass. The rust doesn’t appear too bad elsewhere, but I’ve not stripped the car looking for things. The body definitely needs some love and a paint job to get the car cleaned up. The passenger door needs some adjustment, it doesn’t close easily but will shut and stay closed. I posted a lot of pictures of the car that I took yesterday, you can see them on this Flickr Set. If you would like to see other photos of specific parts please let me know. I am torn on selling the car, as you can see in the intro to this post. I’ve had it for three and a half years now, and I would love to have the time to finish it, but to be honest I haven’t had time over the past 3.5 years, I don’t foresee having the time/motivation to do it anytime soon. I’m not going to part the car out, and if it doesn’t sell, perhaps i will find the time to do more on the car. I spent a few hours cleaning things up yesterday and renewed my motivation to want to work on the car, but still not enough to decide not to sell it. If you are interested looking at the car please use the contact form here on Project240z.com, the car is only available on the weekends to be looked at right now. The two domain names, www.project240z.com and www.240z.net are not included in this sale, but may be available if someone is interested in those. I definitely say you should hang on to it, button it up, and drive the snot out of it. I'd been strongly considering selling my project 240z as well, but decided that I'll just finish it up completely instead. Not only will it be worth substantially more, but I won't feel like it's such a burden to complete any more. 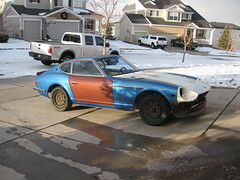 Hey Chris nice z. I was wondering if you or anyone can help get a title for a 1972 and 1971 240z ? I purchased both with not title and was planning on parting them out until I got them home and saw how nice they were.